I’d been in Asia for almost 2 weeks. A week before I hopped on the plane, I’d learned I was fired by my first “gen pop” client. After I’d been in Japan for a few days, I breathed a sigh of relief after closing client “3” in a single call. His retainer landed in my account about 24 hours later. Just in time to make my share of the mortgage without feeling a crunch. “Things are on the up-and-up,” I told myself. Sure, I could have used one more client just to make things feel more secure. But I was in good shape, I reasoned. Next Tuesday, client #4 was scheduled to come aboard. And client 2 was about to enter month 2 later in the week. I woke up in Bangkok Tuesday morning to discover no sign of my new client. He had literally vanished. I haven’t heard from him since. I tried to quell the sinking sensation in my gut. Just as Hillary Clinton voters likely felt in the election we now know the result of, I started to get an uneasy intuition: “more clients have cancelled than have renewed.” The preponderance of evidence was now on the side of early cancellation as a feature rather than a bug. It was DEFCON 1. Full crisis mode. The previous day, when I’d made time to meet up with a drummer friend and play and hang all afternoon, seemed like a dream. 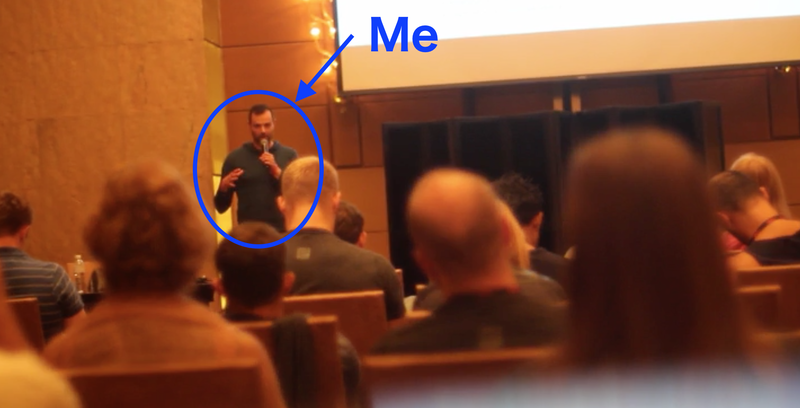 So that’s the state I was in when, during Noah Kagan’s keynote two days later, I made $3000 in ten minutes. But life has a way of pushing back when we try to live it like a storybook. Noah’s talk was one inflection point. Another was a week later when, as soon as cell service was restored on the tarmac at JFK, after a 15-hour flight, the first message I received was from Sean about a client who had had an email freak-out because he hadn’t been able to get ahold of me for a few days. (I’d had a good excuse – weathering a typhoon in Hong Kong, then the aforementioned 15-hour flight). It didn’t take long to hit me that, precisely one year after a text from my old boss from the same assistant, after the same flight (or almost the same – Newark), spelled the end of my day job as of the next morning, I was again listening to my heart thumping in my ribcage for the same exact thing. …then, how one hour later, I closed a new client, and had the archetypal slide-down-the-wall-holding-my-head moment. Gradually, the amplitude of the waves has smoothed out. I still lose some. But I’m losing fewer. And I’m anticipating more. But this is not a happy ending. Real life doesn’t have happy endings. It has repose points, and happy times you hopefully notice before they’re in the past, but more often ignore because you’re too worried about the future. But I know why you’re still reading: you want to hear that Noah story. Alright. I won’t disappoint. Noah’s talk was about taking action instead of talking about stuff. He did a ten minute exercise in which we were all supposed to pull out our laptops and cancel a recurring payment or fire a contractor who wasn’t producing value for us anymore. That hit me in the gut because I’d just been on the other end of it. The second exercise was to try to make money in ten minutes. I think Noah’s original intent was for us to email some existing customers and entice them to lengthen their subscriptions or upsell into a higher service tier. But then people started taking the mic and pitching business ideas to the room. And it was working. This was a do-or-die. This group traditionally frowned on “self promotion”, but for this one ten-minute period, the rules had changed. Until the moment they handed me the mic, I was going back and forth with Chih-Yu. Too late. The mic was in front of me. I guess I should probably rewind 6 hours. Kiri Masters and Dan Norris sat across the conference table from me in the “speakers’ green room”. Zero-hour was in 25 minutes, and everyone was trying to focus on getting it right. I’d run the talk once-a-day since I’d arrived, despite having client work, through the panic of losing 2 clients in a single week. The night before last it had gone well, so I thought I could rest-easy. Yesterday, it had gone badly. Dan excused himself, and, when I was sure he was safely out the door, I started muttering phrases to myself in “Australian”. The talks had been decently attended. As I sprinted to the gym before Noah’s talk, I hoped they’d done the job. Now, with Derek Szeto handing me a live mic, it was game-on. “What’s the old rate?” Noah asked.